Happy Easter to everyone. 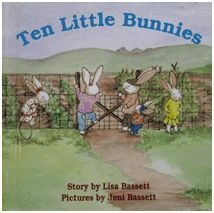 To help celebrate, I have included the cover of "Ten Little Bunnies" by Lisa and Jeni Bassett. I am a first time grandfather as my daughter and her husband had their first child earlier this month. Read more about it below. Entry of the 6B. William Bassett of Connecticut family is complete and his tree has been loaded into the Bassett website database. This tree consists of 3,298 individuals. Much thanks to Sandra Zodrow, a descendant of that family, for entering this tree. Anthony and Elizabeth (Bassett) Jacks. Daniel Richard Jacks at 2 days old. BASSETT, Patrick F. Sr. Born Dec, 20, 1920, he died at the age of 91 on March 27, 2012, among his friends in the Allegro community in St. Petersburg. His survivors include his only child, Patrick F. Bassett, Jr. and daughter-in-law, Barbara A. Bassett, Alexandria, VA; granddaughter, Brooke Bassett, Longmont, CO; granddaughter Alison Maher; and two great-grandchildren, Avery Maher and Carter Maher, Boulder, CO. Born of Italian parents who immigrated through Ellis Island as children in the early 1900s, he grew up in Rochester, NY, served in the Army as a band member in Paris in WWII, and returned after the war to work at Eastman Kodak and to marry his high school sweetheart, Ann Grace Clark. 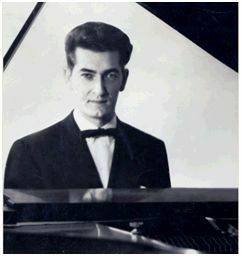 At the same time he assembled and led his own full orchestra during the Swing Band Era ("Swing and Sweat with Pat Bassett"). Eventually he started his own haberdashery business that was successful enough to allow him to retire at age 49. After the death from natural causes of his first wife Ann and his second wife Savilla, he enjoyed three decades of marriage to his third wife, Emily, until her death in 2010. The following message is from David Attride. He has provided several articles during the past 10 years on the Bassetts from Wales. For the last 18 months I have been engaged in a labor of love. The product of this effort will be the book "The Bassetts of Wales." It started about 10 years ago. At that time I had been genealogically active for 20 years pursuing various ancestral branches. My cousin's husband, Walter Degear, saw a Bassett obituary in a California Bay area newspaper and started researching his wife's Bassett ancestry. Family lore said that 3 brothers from south Wales sailed around the Cape Horn and bought farms an hour north of San Francisco in the 1860s. Family lore also said that one of these brothers became rather wealthy, leaving s large estate about 1930 distributing money to various relations. Walter kept digging and found David Bassett's will. It did list the names of 20 nieces and nephews. His interest sparked mine and we began collaborating trying to determine the connection of all these relations (many of whom were names we had never heard). Walter focused on the California branch while I focused on those who stayed in Wales. About this time I made contact with a Jayne Bassett in Glamorganshire who said she was interested in genealogy and had some papers about the Bassett family that a local researcher had given her parents some years before. She offered to send me a copy. Soon I received an envelope containing 120 pages of wonderful research by someone I had never heard of: Barrie Diamond of Fairwater, Cardiff and bearing the date 1992. Something about his name vaguely rang a bell. I read with interest the report of his personal research in the south of Wales. Weeks later, as I was again studying the 1930 will of David Bassett of Long Beach, CA, going over the names of nieces and nephews that neither Walter nor I were able to place, when I saw the name, Cassie Diamond, my immediate thought was: Barrie Diamond. I decided I needed to try and content Barrie Diamond. On the Internet, I checked a UK telephone directory and found a B. Diamond in Fairwater, a suburb of Cardiff. That weekend I called and spoke with Mr. Diamond, an elderly man (since placed in a nursing home). I told who I was, my interest in the Bassett family and provided some background. Then I paused and asked if he recognized the name Cassie Diamond: "Why that is my grandmother's name." I about dropped the phone as I realized this serendipitous path had led me to contact my 3rd cousin once removed, who had spent 20 years researching the Bassetts! With his blessing I have copied his research notes and added several years of my own research. My largest contribution has been to locate and transcribe every will probated for a Welsh Bassett (140 in total). As I finished this task I decided that I needed to share this information with others. That effort became the book which I will privately publish this summer. It covers the earliest information on Bassetts in south Wales (12th century Charters); Wills from 1551 to 1858; more than 100 figures of Bassett properties, local churches and several family trees I have created; Bassett pedigrees from the Golden Grove and Jim Terzian; and information on allied families: David, Gibbon & Leyson. To see a glimpse of the book, go to my website: david-attride.net and click on the hyperlink at the lower left. I encourage anyone potentially interested in purchasing a copy to contact me. Born in Utica, New York in 1875, Harry Bassett wanted to study law after graduating from high school, but this was not to happen. He position of office boy became available at the Remington Arms Company, noted maker of firearms, and he took this job, training in product improvement, cost-cutting methods, and camaraderie with his fellow workers, which he would later use in the automotive manufacturing business. He worked hard and stayed with Remington for fourteen years before being asked by Charles S. Mott to join the Weston-Mott Company of Utica, a well-known manufacturer of wire wheels and rims for bicycles, carriages and other vehicles. With the advent of the automobile, they had started production of axles, hubs and automobile rims. 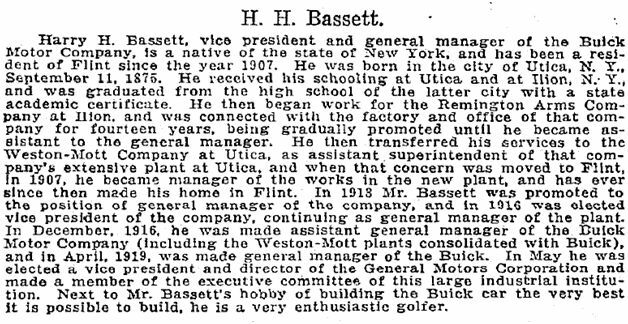 In 1915 Bassett became assistant superintendent in Utica, and within a year, went to Flint, Michigan to become factory assistant manager, then the next year, manager. 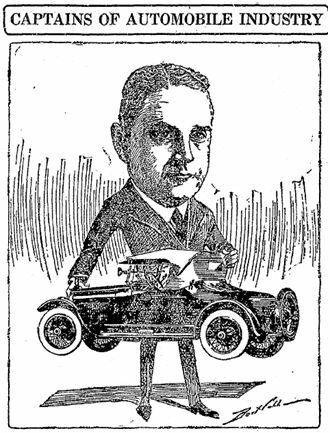 The automotive business was growing and it needed a man like Bassett. He communicated with his employees as a friend, rather than a boss. By now, 60 percent of Weston-Mott's production was for GM. This led to the consolidation with Buick and, in 1916, Bassett became assistant general manager of the combination. He was continually out in the factory. By 1919, he became Vice-President of Buick, where he built sales to the top of the industry, second only to Ford. Buick's output in 1916 before Bassett joined was 43,946 cars. By 1920, production reached 115,972 cars. His attitude was ton constantly improve the product, not only mechanically but visually, "Progress is the law of the world, and it must be the law with Buick." Buick built more than 200,000 cars during the calendar year of 1923. Bassett's success with Buick was phenomenal, not just in record-breaking sales, but also with the men who built and distributed the cars. Once at the factory he heard there was a problem, so he went to the workers and asked, "What's the trouble, boys? I hear you're not satisfied-tell me all about it and let's see if we can straighten it out right away." The men replied, "We're not earning enough, Harry." Bassett told them, "I think you're right. The rate is fair enough, but there isn't enough production, and that's not your fault, it's OURS. By the fifteenth of next month, enough work will be coming in to improve that, and between now and then, we'll make up the shortage." The men were happy with this and morale soared at the plant. Bassett believed in the spirit of human kindness, or in his words, "I like people. I like to help others get along." And that's really what our old car hobby is all about-being able to build and share the cars with the people. REDWOOD City, April 12 – Because his fiancée, Miss Clarence Brooks missed the noon train out of San Francisco by a fraction of a second today, Burton Bassett, a San Jose business man, was kept “waiting at the church” for two hours and a half this afternoon. Undaunted by the nonappearance of his bride to be, he remained faithfully at the appointed meeting place. Mr. Bassett’s patience was rewarded with the arrival of the 3 o’clock train, which brought his belated sweetheart. They hurried to the county clerk’s office, secured a license and were married by Rev. David M. Crabtree of St. Peter’s Episcopal church. After the ceremony they boarded a train for San Francisco. Mrs. Bassett is young and pretty and comes from Denver. PALO ALTO, April 16 – The honeymoon of Mrs. Burton B. Bassett was suddenly terminated here yesterday when she was arrested on a charge of kidnaping her husband, a student of 17 years. The boy’s family has employed counsel to bring annulment proceedings. Miss Clarence Brooks came out from Denver a few weeks ago with her mother to visit the Bassetts at their home in Channing avenue. The elder Bassett, now deceased, was formerly an attorney of the Colorado city and the Brooks were old friends. Young Bassett is attending a preparatory school in this city for entry to Leland Stanford university. His brother, W.W. Bassett, is well known in track circles in the university and is a member of the team which will compete Saturday. The student fell in love with the fair visitor under his mother’s roof and last Saturday appeared in Redwood City and asked County Clerk Joseph H. Nash for a marriage license. This was refused because of the absence of the bride. Bassett telephoned to Miss Brooks and at 3 o’clock she came. Bassett said he was 22 years old and Miss Brooks said she was 26. Rev. David M. Crabtree of the Episcopal church married the couple and they went to San Francisco on a honeymoon trip. Monday morning they returned to break the news to the family. Mrs. Bassett was horrified. She charged the bride with kidnaping her boy and in her anger summoned in the chief of police and had the young woman arrested. When released, the bride and her mother, Mrs. Brooks, left for San Francisco. Mrs. Bassett says that her son is but 17 and that Miss Brooks is 31. PALO ALTO, April 18 – Burton B. Bassett, the 17 years who was married last Saturday in Redwood City to Miss Clarence Brooks, 14 years his senior, left his home today, and his mother, Mrs. Gratia Bassett, believes that he has joined his bride and her mother, Mrs. Brooks, both of whom left for San Francisco when Bassett’s family threatened to have the young woman sent to jail for kidnaping. W.W. Bassett, the elder brother, has sought counsel, and Mrs. Gratia Bassett today interested City Attorney Norman E. Malcolm in the case. Efforts will be made to thwart any attempt of the couple to leave the state. Mrs. Bassett stated this evening that she would have a warrant issued against the woman under the state juvenile law regarding the care and custody of a minor child. Annulment proceedings will also be brought. PALO ALTO, April 19 – Burton B. Bassett, the 17 year old Palo Alto student who shocked his relatives by eloping last Saturday with Miss Clarence Brookes, 14 years his senior, returned to his mother’s home here today after bidding a final farewell to his bride in San Francisco. According to Attorney N.E. Malcolm, who is representing Mrs. Gracia Bassett, the boy’s mother, Burton has come home to stay and has signified his intention of being obedient to his family’s wishes. The annulment suit filed by Mrs. Bassett is probably the last chapter in her son’s romance. Mrs. Brooks and her daughter left their apartments at the Hotel Stratford in San Francisco today and it is understood here that they are returning to their home in Denver. SAN JOSE, April 18 – The tale of the shattered romance of a 17 year old bridegroom is told in a suit for annulment filed today by Mrs. Grace Bassett of Palo Alto in behalf of her son, Burton B. Bassett, against his wife, Mrs. Clarence Bassett, who was formerly Miss Clarence Brooks of Denver, Colo.
ESCONDIDO, April 23 – When Burton B. Bassett, who at the age of 17, has incurred the displeasure of his mother, Mrs. Gracia Bassett, by marrying Miss Clarence Brooks, about a dozen years his senior, was a junior in the Escondido high school, he used to tell the boys and girls at the class parties that while he did not know the name of the girl whom he would make his wife, yet he had decided upon an early matrimonial alliance. At that time young Bassett, who was known as “Birch”, was the assistant circulation manager of the Union and Tribune in Escondido. His mother, Mrs. Gracia Bassett, is an artist of considerable ability, and at one time conducted a studio at San Diego. She is a widow, and “Birch” is the youngest of three boys. PALO ALTO, June 3 – Judge Richards of San Jose yesterday annulled the marriage of Burton E. Bassett, the 18 year old student, and Miss Clarence Brooks of Denver. The couple eloped to Redwood City two months ago when Miss Brooks was visiting the Bassetts in Palo Alto. Mrs. Gracia Bassett, the boy’s mother, brought suit on the ground that her son was under age. She declared the bride is 29 years old. I have not yet placed Louise V. Bassett and her husband. If you have information on this couple, please contact me. HERRINGTON, Kan., Nov. 17 – (United News) – The body of fiery-haired Louise V. Bassett, alias Louise Horton, 36, whose record revealed a long list of bootlegging transactions which led to her being shot and killed by a Kansas sheriff, today waited the instructions of her husband, who was taken from a jail cell a few weeks ago to marry her. 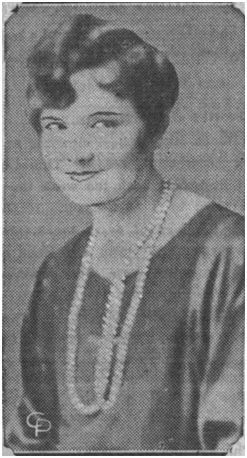 Mrs. Bassett was killed outright Friday night by Sheriff Sidney C. Dederick who attempted to stop a car near here in which he believed the woman and a man companion were transporting liquor. The officer remained on the running board of the automobile after Mrs. Bassett warned him she would shoot and when she shoved a pistol into his side he whipped his own weapon from his pocket and fired. A coroner’s jury late yesterday returned a verdict exonerating the sheriff. Mack Howard Harris, companion of Mr. Bassett, said he believed Dederick would have been killed had he not fired first. Harris said he did not know the woman was armed. No new participants were added this month. Results of one Bassett are back and I hope to report on them in the next newsletter.